Although Safed is not particularly well equipped with parks or playgrounds there are some little gems in hidden corners, as well as playgrounds in the various neighborhoods. The main park is the Metzuda or Citadel Park which dominates the heights of the city. Although it has been rather neglected in the past it is now being landscaped again. It is a great place to exercise your dog and it's lovely to picnic in the summer under the trees. This is the main city playground for children and is on the corner of Jerusalem Street and Ari Street. It is shaded and is a popular place for children to play, even though in the height of summer it can get rather crowded. There are lots of benches as well for parents to watch their children playing on the equipment. Another lovely park and playground is tucked away behind the Saraya (Wolfson Center). Thanks to the generosity of Mimi Semuha, who lives in the adjoining building, the park is well furbished with modern play equipment. There are plenty of trees for shade and grass or benches for parents to sit on while they watch their children. This park is maintained by the residents of the building and is semi-private. The Beit Avot (Old Age Home) is opposite and its residents can enjoy seeing the children playing. Nearby is a fountain, unused due to the water crisis, where you can also sit. Across the street are the remains of an olive orchard around the Post Office and the Yigal Allon Theater where you can walk your dog, or climb a tree. Next door to the Rimon Inn on Tet Zayin Street is the Ziffer Sculpture Garden, one of Safed's hidden treasures. As its name implies it has work by Moshe Ziffer, who donated his sculpture garden to the city. The main gates are often shut, but the side door is usually open. This little used park is maintained with the help of some local residents. The Old City's only purposely built playground is half way along Alkabetz Street, just above the Josef Caro synagogue. It is a modern playground with the latest in tubes, climbing frames and slides and is well used by the local children. Although there is no grass you can sit on the stone seating or in the nearby mini-amphitheater. In the summer a favorite place to go is the outdoor swimming pool with its surrounding park and nature reserve. This is located at the entrance to the city, just past the Egged bus station. Safed's second sculpture park is located high above the city. The well known sculptor Victor Halvani's work can be seen in the park from the HaGalil Road on the way to the Ramat Razeen neighborhood. However, it is worth making the effort to see the sculptures up close. If you leave the shuk to go up to Canaan there is a delightful small park surrounding the stairs leading up the hill. By climbing the steps you get a great view, exercise and can smell lovely flowers as you go. 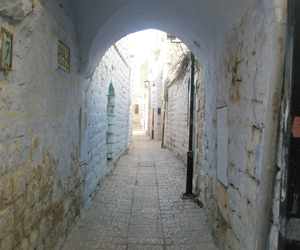 We tend to forget that Safed is surrounded by the biggest park of all - the beautiful countryside, forests and wadis. So why not explore the landscape around the city? Just remember to take enough water with you, stick to well marked footpaths and take your cellphone in case of emergency.